On November 2010, a special series collection was produced for the HeartGold and SoulSilver TCG. 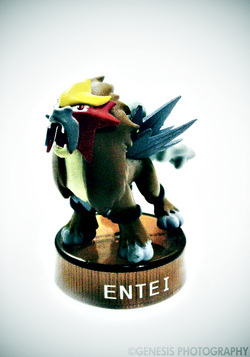 This includes 5 booster packs, 3 holo foil cards and a special Entei bottlecap figure. This figure is the same as the one produced for the 10th Anniversary series with the only difference being the base. Sealed Chamber was created and maintained by Zefiru. Opened October 2010. Pokemon are © Nintendo and Game Freak.